Super Tuesday: Politisite Political ProjectionsWe are finally Here! From Alaska to the North and Georgia to the south and New York to California, This is the closest thing to a National Primary this country has ever seen. The possible outcomes of each contest is mind boggling as in some cases with delegate distribution will winner takes all, in others a percentage will be given. It is different for each party as Democrats have one way of distributing delegates and Republicans have another. The same goes with voting. In some states you can vote for who you want in either party, in others you have to vote for a candidate within your party, in still others independents can vote in a primary, in others they can’t. Confused?, Well you ought to be its Super Tuesday! This is where the Pollsters and Pundits make the real money. If you get it right, your a hero and on every cable channel, if not you are pushed to the side like yesterdays news. This is the nature of political projections. I use a momentum modality with my projections. Following is a summary of my rational for for using this type of forecasting. Trends: One or two data points doesn’t make a trend. The trend is your Friend and should always be used in analysis of possible outcomes. Had pollsters considered trending in New Hampshire, they probably would have had the numbers correctly. The problem is that they use data that is a day or two old and they give percentages based on the numbers. Trend lines are not used. Real Clear Politics has trend lines below the polls so one can see how the candidate is moving. 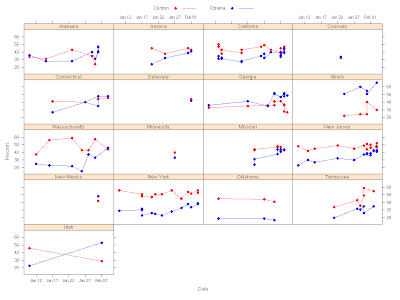 You can also use these graphs to gauge where a candidate will be on election day. When I invest in the stock market trend lines are part of what I use. I like momentum. It is very difficult to stop a rolling train. When things are in motion, they will continue to stay in motion unless there is proper resistance. This can be immediate resistance which takes more power (a Major News Story) or gradient resistance which causes things to stop, like a rolling ball. Due to Space and Time I am going to give only the Results for each state rather than technical analysis on trending, frequency, and poll data. So there you have it. These are my projections for the Southeast and large Delegate states. Looks like McCain Dominates save one, Arkansas where Huckabee is a clear winner. Looks like voters have shifted in the Republican race from who they like to who can win. The trends earlier this week looked like Huckabee was strong and winning in the south. Following McCain’s win in Florida and Giulani throwing his support McCain’s Way, Trends for Huckabee went downward. Trend lines for McCain began to rise rapidly. While Romney is trending up he will not win any races in the south and will also lose California and New York. Romney began trending upwards last week but too slowly to catch up. Romney’s closest race in the South is Georgia where Romney is within the Margin of error. my best guess is McCain still win Geoegia. Politisite uses Raw polling data, Trend lines, and other materials that help project what the numbers will be, not what they are. If you looked at our Florida numbers, no matter what my gut told me the numbers didn’t lie. Pollsters can only give you what the outlook is if the election were held today. My projections help you see what the numbers will be on Tuesday Feb 5th 2008. Please come back and see if we are correct. On the Democratic side the race has tighten to within the margin of error in 3 states we cover. California, Alabama, and Missouri could fall either way. We think the outcomes will be as we state but with a margin of error of +/- 3% Points a one pont lead doen’t cut through. Here is how it works. If both have 50% either could have 47-53% meaning a 6 Point spead. Polling margian of wrror is based opon sample size and demographic consistancy. Clinton is clear winner in Arkansas, Arizona, New York, and Tennessee. Obama is a clear winner only in Georgia. I will see you here on NowPublic and Politisite.com Tuesday night for my Near Real Time Election Results for all of the Southeast, New York, California, and my favorite Alaska where Ron Paul will have his highest percentage in this election. Earlier today, I participated in a blogger conference call with Gallup’s Frank Newport, in which he talked about their latest surveys in California and New York, as well as their intriguing new project, the Gallup Daily. Starting in early January, Gallup started completing 1,000 interviews each night. Starting last week, they are now reporting a three-day rolling average of the presidential primary trial-heat questions. They will release new results each day at approximately 2:00 p.m eastern time — today’s results are here, each new release can be found here along with a daily report on consumer confidence. True polling junkies will know about another similarly structured poll tracking program: Rasmussen Reports has put out daily updates on the President Bush’s job approval rating for many years, and has been reporting three-day rolling average presidential primary tracking since October. Of course, the Rasmussen data is collected with an automated methodology known as interactive voice response (IVR), in which respondents hear a recorded message and answer using the keys on their touch-tone phones. Whatever you think of IVR polls — and the methodology certainly remains controversial in the survey research world — the Gallup program is distinct from Rasmussen in other ways than the use of live interviewers. According to Newport, the Gallup Daily uses the “same robust methodology” as all other Gallup polls: live interviewers, a random-digit-dial sample, as many as 5 “call-backs” to those not home when they call, cell-phone sampling to reach those in cell-phone only households (something Gallup also introduced to their standard methodology this month) and Spanish speaking interviewers available for when they reach a household in which only Spanish is spoken. That “call back” procedure may sound excruciatingly wonky, but it is important and a key distinction from the Rasmussen tracking. So far at least, Gallup has used a procedure that dialed each sampled number as many as five times over successive nights if the initial attempts were unsuccessful (that is, if the number was busy or if no one answered the telephone). They structure their calling procedure so that the sample on any given day is equivalent to a sample dialed for many days. Each day has the same mix of attempts (first, second, third and so on). The Gallup Daily survey design has two critical benefits, according to Newport. First, obviously, it allows us to attempt to monitor the impact of major campaign events on a daily basis, such as the Barack Obama’s victory in South Carolina. Newport reported that their sample last night had Clinton ahead by 10 percentage points (he did not provide specific percentages), while the result over the last three nights had Clinton leading Obama by 11 points (43% to 32%). So Newport’s sense is that the South Carolina results has not yet dramatically changed the Democratic standings. However, a quick glance at their chart shows something else that Newport confirmed. The Democratic race has narrowed significantly over the last week. Clinton lead by 20 points (48% to 28%) on their January 20 release but, again, by only 11 points today (43% to 32%). Given the large samples involved (approximately 1,200 leaned Democrats for each release), both the Clinton decline and Obama increase over the last week are statistically significant. not a primer on how to conduct a public opinion survey. “scientific” one worthy of coverage – or an unscientific survey without value. the classic toilet tissue poll featuring pictures of the candidates on each roll. opinions, selecting themselves for the poll. even the opinions of all Americans. The results of an unscientific poll tell you nothing beyond simply what those respondents say. What area (nation, state, or region) or what group (teachers,lawyers, Democratic voters, etc.) were these people chosen from? What about polls on the Internet or World Wide Web? In what order were the questions asked? What other polls have been done on this topic? Do they say the same thing? If they are different, why are they different? What else needs to be included in the report of the poll? So I’ve asked all the questions. The answers sound good. Should we report the results? Now that the first “Super” event of the week is over, time to turn to the next one.We’ve got a number of polls in several states, fewer polls in others. Here are the trends in the 17 states for which we have polls since January 1.In the Republican chart below, I’ve omitted Utah where Romney holds an 84-4 lead over McCain, according to the one Republican poll since January 1. 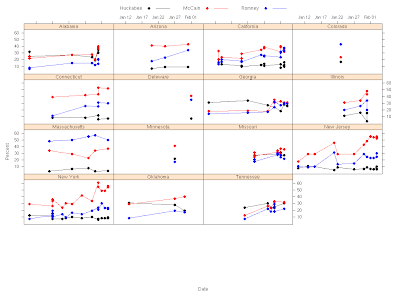 Expanding the scale to include that data point makes it hard to see the differences in all the other states.See the individual state charts at Pollster.com for trend estimates in the states with sufficient polling. Here, look at the data and reach your own conclusions. The data here are through Sunday. I’ll update the charts Monday evening with the Monday polls.